Was the Volvo with a V6 swap we posted earlier today a bit slow for your liking? Okay...I get it. 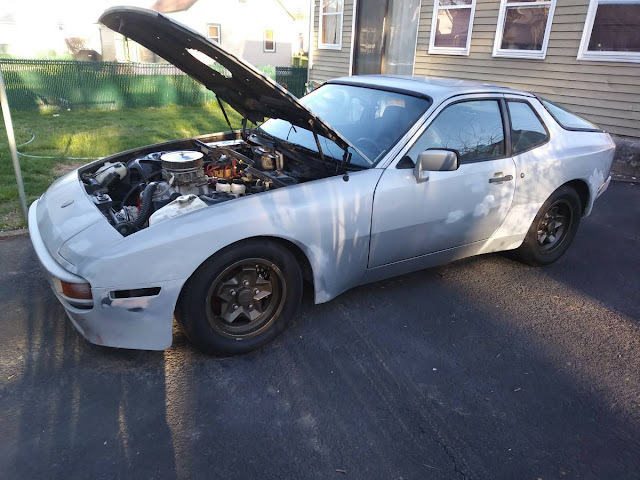 How about a Porsche 944 with a small block Chevy, is that fast enough for your inner Dale Earnhardt Jr? Find this 1983 Porsche 944 V8 offered for $6000 in Baltimore, MD via craigslist. From Cory. Body is all prepped for paint considering selling before having it painted. This engine swap eliminated the biggest issue with a porsche in general. The outrageous engine rebuild/maintenance costs. 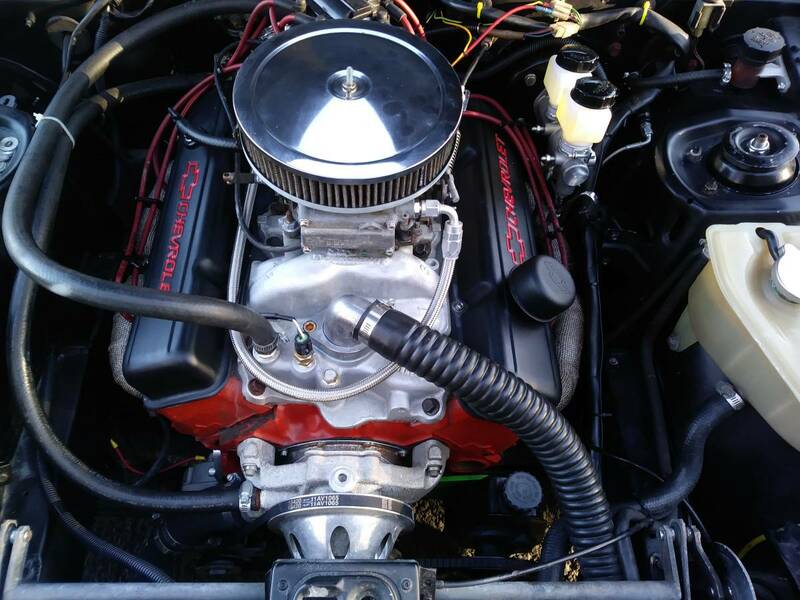 In its place is a massively cheap and easy to maintain small block chevy. Where the sky is the limit with power potential and replacements are everywhere! Headers, intake manifold, holley carb, melling cam, all Texas performance concepts swap parts, uses porsche transaxle, willwood 4 piston brakes and master cyl\slave cyl, stiffer front suspension for the v8 weight, all speedhut gauges in the dash and all work, runs amd drives really well. Really cool car. Sounds wild coming out of this car! Exhaust comes out a stock looking single exhaust. Any other questions let me know. Sure theres details I'm leaving out. Has heat no ac. Has ps. Electric fans wired to thermostat, have hood scoop for the hood that i spent some time making it fit very well. Isnt on because wanted to paint the car and the scoop seperate then install. Easily over 8500 just in recent work and upgrades to the car. Its all prepped for paint and im going to have it painted if no interest. No time for toys reason for selling. Its a seriously cool car with how balanced and capable the chassis is and now with some real power its a serious car now! Make all the camaro and mustang guys wonder what this weird porsche that sounds like a race car is lol. Car is just begging to drift, drag, autocross, or just be a cool weekend car! Orrrr slap a supercharger, some big turbo, and make it a serious race car. Stock porsche rear/trans/transaxle. Yes it handles the power, it wont handle it with drag slicks and wide open launches, no. Upgrade to a 951 transaxle or a corvette tranxaxle or a viper rear or some other set up if you want to be super aggressive. As it is its fine for spirited driving but wont handle slicks and whatnot. How clean it looks with the alternator mounted low... although the brake rotors look good a rusted so I wonder how long it's been sitting? Nicely done swap. Very neat and clean. Makes me think I might even be able to handle owning a Porsche... however, if the seller actually fastens down the hood scoop shown, I would have to light it on fire. 62 Corvette aircleaner for example, or any of many OEM aircleaners that fit down over the carb. Cutting a hole in the hood just to use a cheap aircleaner it stupid and lazy. The only reason to replace 944 brakes I can think of is to sell the originals for lots of money. Other than that, this is cool enough. Seriously, we have seen too many jigsaw holes of as of lately. But let's be Frank (even if you're Stan, or Sean, or Vince...). Pretty much ever livin' thing on a Porch is crazy money. A 944 windshield wiper motor costs as much as a Japanese small block, fer Pete's sake. Ugh, though (just looked at the last pic in the ad). Only reason to put a Corvette Summer Scoop on a beautiful car like the 944 is to scream "HEY!!!! I REPLACED THE ENGINE HERE!!!!" PS Nice suggestion Sean. But methinks part of the reason for the hood scoopers are more air circ/cooling, no? Sean responds, "Surely you can't be serious," prompting Stan to say, with a straight face, "I am serious. And don't call me Shirley." Not sure on this theory of cooling. It's not like the turbo version needed more engine compartment cooling. And yes, I too owned a Nein forty 4. Really fun cars. I think the Cory's 968 would have been a great project.